Kat Von D Autograph Eyeliner. I've recently become fond of liquid liner, and I've pretty much worn it every day for the past 6 months. During that time I've tried tons of different brands- Urban Decay, Sephora Brand, Wet N Wild, MAC, et cetera. Out of all of those, I like Kat's the best. I'll admit, the first two I bought just for the name- Black Metal Love (KVLT!!!) and Love Metal (seriously, I do.) The other two I had to get because I loved the first ones so much- Turbo Lover and Romantico. The brush on these is pretty much perfect- long enough to draw a straight line without making a mess, stiff enough not to splay but soft enough not to skip, and holds plenty of liquid so you don't have to dip so much. The packaging is great- the bottles (jars? what do you call that part?) are the exact color of the liner inside- actually, I'm thinking they're transparent because it's such an exact match. The handles of the brushes are nice and long with a rubberized feel to them and beautiful silver artwork. They all dry very quickly, which is awesome for me because I hate waiting for my liner to dry before I can curl my lashes. The texture is smooth and even, no chunks, not runny and not too thick. Texture is an important factor in achieving a straight and flawless line. Too runny and it bleeds, to thick and it skips. These are just right. And once they're dry, they don't budge, smudge or flake. Most importantly, all the colors have character. See below. Romantico, Turbo Lover, Love Metal, Black Metal Love. 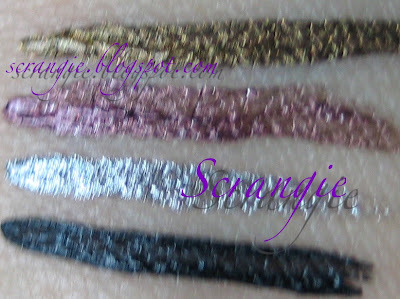 I apologize for the poor quality of the swatches. I just couldn't keep my hand still for anything! I really need to cut back on the coffee. Romantico is a deep antique looking gold that dries looking pretty reflective. It has just a hint of sparkle in it, and it's incredibly beautiful when it catches the light. Turbo Lover is a metallic plum burgundy shade. It doesn't look red on your eyes. It's also metallic and reflective when dry. It really brings out the color of my eyes, and I'm sure it would look awesome with all eye colors. 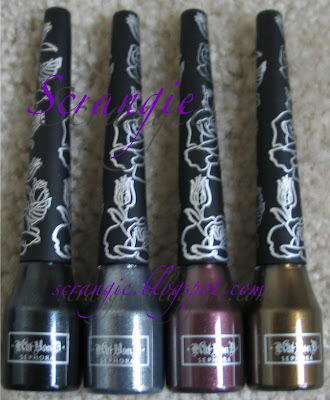 Love Metal is everything I wanted Urban Decay's Revolver liquid liner to be. It's shiny, sparkly, reflective pure metallic silver goodness. A strange sounding but beautiful way to wear it is with a light gold eyeshadow on the lid. Gold and silver together doesn't sound like it would work, but it looks so interesting and pretty! You could also do it in reverse with a silver eyeshadow and Romantico liner. Last, but definitely not least, Black Metal Love. A pure, super-dark jet-black matte liner with super-tiny silver microglitter. I think the microglitter really makes it. It doesn't look glittery at all- it looks like dark black matte eyeliner. When the light hits it you see the silver microglitter and it's just so fascinating to look at. I don't know if I can go back to plain black liquid liner.... I like the glitter! 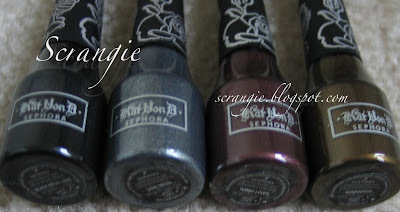 If you're into cat eyes, retro glamour or just love liquid liner, you might want to give these a try! They're available exclusively at Sephora. And wow for those colors! PS: I'm adding you to my blogroll, too. I just got this in Turbo Lover. When I put it on, it goes thin and watery or over itself almost erasing itself (like a sharpie when you try to use it on a glossy/wet paper - not sure how to describe it). I have other liquid liner that doesn't do this. Not sure what may be wrong. I really love this plum color and want to use it. Any suggestions? Thanks! I just recently started having this problem with Turbo Lover too. It didn't happen when I first got it! Sana I must appreciate your eye lining techniques...very nice and the range chosen is also very impressive.